Just looking at the sentiment jump this week and comparing to a similar reading at the end of February, when the S&P dropped 95 points. I'd be cautious about jumping on any early strength, just based only on that. Mike Burk's statistics: "Returns for the coming week have been strong by all measures and sensational during the 3rd year of the Presidential Cycle." Then there is Thursday's early close and Good Friday's close to consider. 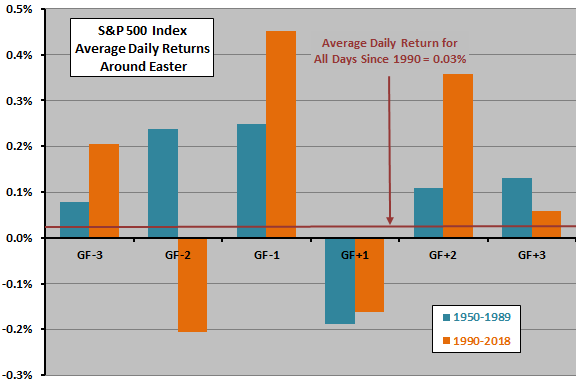 Results on average suggest an up-down-up oscillation from the trading day just before through two trading days after Good Friday. Edited by Rogerdodger, 13 April 2019 - 11:40 PM. I suspect that you're right. There's some good seasonality but we've got some over-done sentiment and momentum has largely turned down. Breadth is solidly positive though. And now momentum has turned up.